One of the most useful, and effective fishing lures is the common spoon. Here’s how to make a good one, for pennies, from recycled materials. I started making fishing lures many years ago after balking at the price to replace those lost when fishing around rocks, trees and snags. One the best, and most effective fishing lures under a variety of circumstances, is the spoon. As the name implies, the spoon fishing lure is shaped like a spoon you eat with. After a fishing trip where I lost a bunch of lures, I looked at a standard culinary spoon. 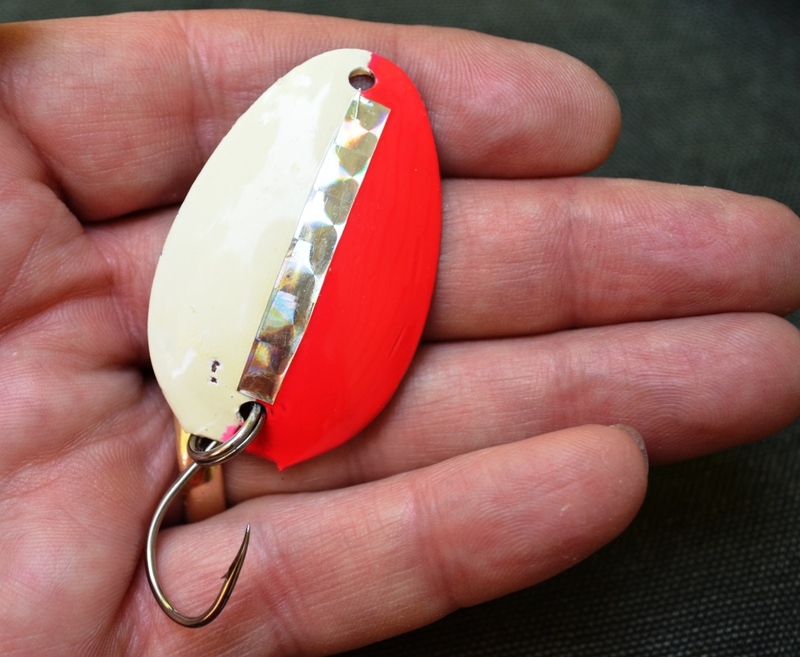 With a little effort I decided I could come up with an interesting – and cheap – fishing lure. The first commercial fishing spoon was apparently made by the Eppinger company, which has been making the Dardevle spoon since the early 20th Century. Knockoffs have probably been around for nearly as long. The history of the Dardevle name is an interesting one…according to the Eppinger website, the first fishing spoon was originally named the “Osprey” by inventor and company founder Lou Eppinger. Toward the end of World War I, its name was changed to Dardevle in honor of the “Teufelhunden”, or “devil dogs,” a nickname given to the 4th Marine Brigade by its German foes during the Battle of Belleau Wood in 1918. The classic Dardevle is a distinctive red-and-white striped model, and is a deadly lure for pike, muskellunge, bass and trout…in fact, most fish that eat other fish. I have used a spoon to catch all these fish, and have also used one to land perch, crappie and smallmouth bass. The classic red-and-white Eppinger Dardevle spoon has caught fish for generations of fishermen. You can make your own variations for pennies. Frugal fisherman that I am, it didn’t make sense to spend upward of $5 on a lure, when I could make a pretty good substitute with just a little effort. The raw material is easy to find: Old culinary spoons of various sizes can be found at thrift stores, garage sales or any place that sells junk. The other hardware and decorative items can be bought at any sporting goods or craft store store. 1- spoon. The size depends on what you want to catch, or what you found at the thrift store or garage sale. Cut or break off the handle of the spoon (and save it for another project). Drill a small hole at either end of the remaining spoon bowl, and attach a split-ring through the holes. At the larger end, attach a hook through the ring; at the smaller end, attach the swivel, which will keep the lure action from causing line twist. Paint and/or attach reflective tape to the convex side of the lure. I used my homemade spoons extensively on a nine-day canoe trip through the northern Minnesota Boundary Waters several years ago. 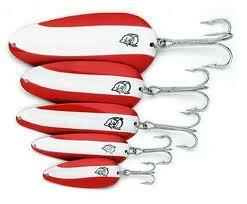 On several lakes, the red and white with silver tape pattern was the number one producer on northern pike. If you are fishing the edges of weed beds, use a weedless hook with a bucktail or streamer, and get ready for a hit! My inherent penny-pinching cheapness – frugality, I prefer to call it – came from my dad, who grew up during the Great Depression. But, this trait is also valuable in the preparedness / survival field. Save money on things you can make, and invest the savings on items you can’t compromise on. 5 Comments on "Do-It-Yourself fishing lure: Make a fishing spoon lure from a kitchen spoon"
I was interested in trying this and wondered about the supplies to buy. Do those come in packages with more than one in them or in singles? I plan to do these as a present for my mom and step dad. They like to fish and I am virtually clueless. The split rings, swivels and hooks come in packages of about five to a dozen – get them at any sporting goods store. Get the spoon from a thrift store, and paint it with whatever you have. I have a variety of fingernail polish I use for modifying my fishing gear. Maintains bright colors and lasts. Pick them up at yardsales or dollar stores. Another good pattern to do is to paint the backside of the spoon a shiny black and then paint an orange stripe similar to the white one on the red Devil. Also, painting the lure a bright yellow and some diamonds on the back is also another great lure that works well. Both these combinations are great on different types of fish from trout to bass to pickerel to perch etc. I have Rooster tail made with the help of this article although it took me a lot of time to get the result that I wanted but it was fun doing it and it totally works. No doubt! Thanks!